From Ancient Spartans to today’s U.S. Navy SEALs; from the gladiator’s arena to the boxer’s ring -- warriors are among the most conditioned athletes in the world because fitness is a prerequisite for their survival. A balance of stamina, strength, flexibility, and agility is required. Big, bulky, body building “Rambo-ish” physiques on a battlefield would be an easy lumbering target. Dojo Chattanooga is now offering a unique fitness program, “Warrior Fit” that brings a high intensity full body workout using old school exercises that develop functional strength ideal for not only the martial artists but anybody looking for greater power and stamina with increased range of motion -- building lean muscle, burning fat, and educating your body to work as a synchronized whole. Core strength (source of power and stabilization) and grip strength (final crucial link of power) is emphasized in every exercise -- both athletic qualities required by warriors throughout the ages. The equipment is simple: Kettlebells, Indian Clubs, rope, and chains (yes, we know this sounds like a medieval dungeon). 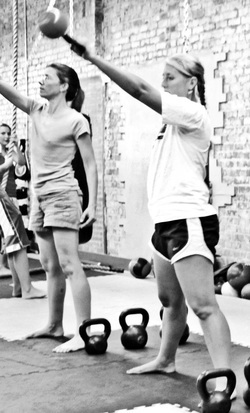 Kettlebells look like a cannon ball with a handle with the weight displaced from your grip. This challenges grip strength and results in the kettlebell pulling away from your body forcing your entire core to work overtime to support and control the weight. Popular now for conditioning kickboxing and MMA champions, the kettlebell was used in Soviet Russia to condition their elite special forces. The Indian Club, from the culture that brought us Yoga, is a bowling pin looking device that is superb for working range of movement in the shoulder girdle. Originally created as a way to condition a sword wielding arm, club training now benefits the speed of a boxer’s punch, improves a golfer’s swing, and strengthens a tennis player’s serve. Used for the training of warriors of old, the Indian Club is in use again by the United States Army Military Academy at West Point for the conditioning of our next generation of military officers. Indian Club exercises are ideal for increasing flexibility and improving coordination. Rope exercises are amazing for grip strength but actually engage the entire body from head to toe. A vertical climb up the 18’ rope is for some people, but others receive much benefit while still keeping both feet firmly on the ground. Either way, your forearms and abs will scream while grasping the 1-1/2” diameter manila fiber rope -- feeling like you have an overgrown tiger by the tail. Chains are used (handles attached) for suspension exercises lifting your own body weight. The muscle intelligence that results from push-ups on handles hanging from five feet of chain is phenomenal. Your abs, calves, quads, glutes, pectorals, triceps, and forearms all call an emergency meeting and try to work together to meet this new challenge. By changing your body angle you can quickly go from push-ups to pull-ups and a simple step or two can adjust the amount of body weight you lift. No fancy machine needed -- just a chain with a handle attached to a strong beam. Who is attending this class? Twenty year olds looking for a new challenge, Moms and Dads determined to win the battle of the bulge, and teenagers cross training for high school sports. Classes are 30 minutes long and conducted in a circuit format. “Warrior Fit” is offered as a stand alone program at Dojo Chattanooga ($40 per month) or is included with all traditional martial arts and fitness kickboxing memberships.